Figure 1. Alaska harbor seal survey effort in 2015. 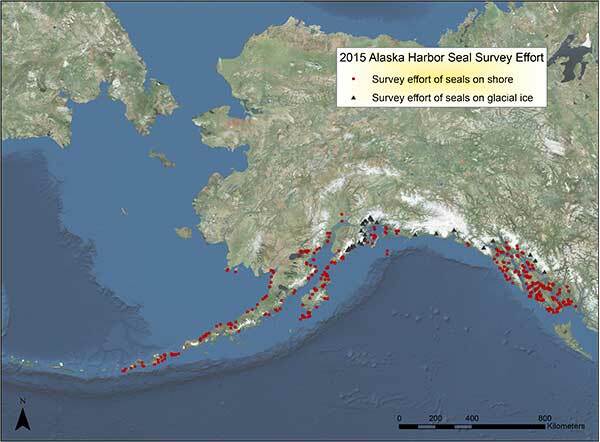 The National Marine Mammal Laboratory’s (NMML) Polar Ecosystem Program conducted extensive aerial surveys for harbor seals throughout much of the species’ range in Alaska during August and September 2015. In July 2015, shore-based counts of harbor seals were obtained on Otter Island in the Pribilof Islands. Aerial survey effort extended from Ketchikan in the southeast, to Umnak Island in the Aleutian Islands, and to Lake Iliamna and Nanvak Bay in the Bristol Bay region (Fig. 1). Two NOAA Twin Otter aircraft were used to conduct the surveys with the support of NOAA’s Aircraft Operations Center. In addition to the surveys of seals hauled out along shores, seals that hauled out on ice within glacial fjords were photographed using a multi-camera array. With few exceptions, remarkably favorable weather allowed biologists to survey nearly daily—logging more than 170 flight hours and completing the first comprehensive survey of all Alaskan tidewater glacial fjords where seals occur. Researchers also took the opportunity to test new, higher-resolution cameras and an infrared camera system that will be used in future surveys of harbor seals, as well as ice-associated seals in the Chukchi Sea.